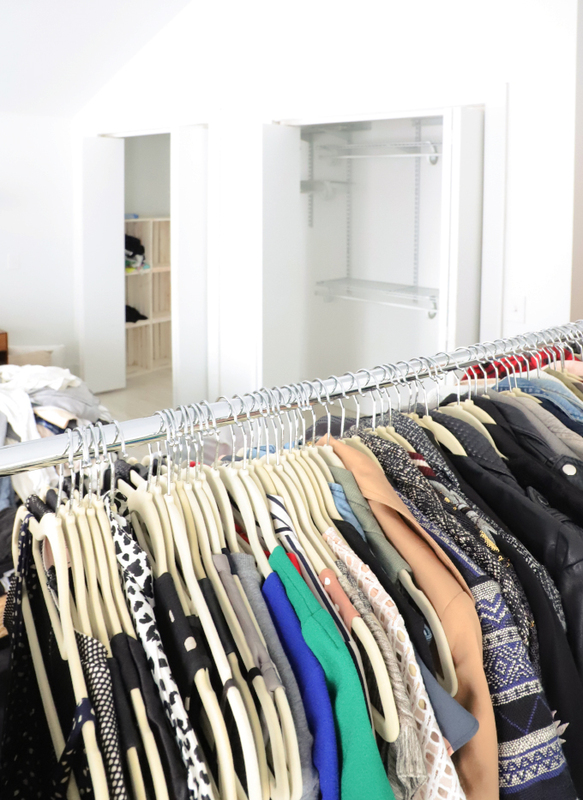 This year I have been organizing my home one room at a time, and it’s finally time to tackle the closet, yikes! 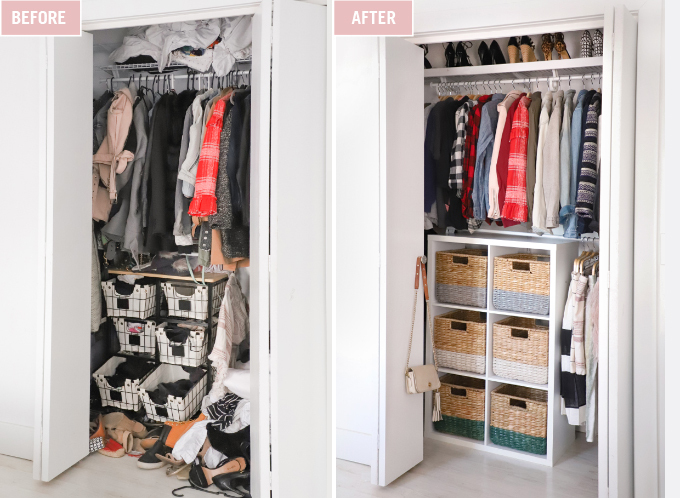 I have always been guilty of stuffing my closet way too full with clothes, which makes it impossible to designate spots for everything (please refer to super embarrassing before photo). It was time for a major clean out, and time to implement an organizational system. 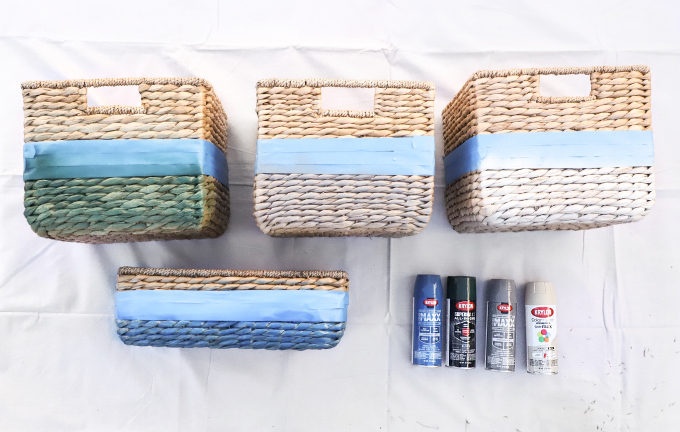 Color-coding makes everything look prettier, so I gave my new baskets a makeover with Krylon® SUPERMAXX All-In-One in Gloss Hunter Green and Krylon COVERMAXX in Gloss True Blue, Gloss Classic Gray, and Satin Almond spray paint to help me remember what goes where. I’ll admit, I sleep with the closet doors open now, because the final result makes me grin ear-to-ear when I wake up. It’s SO MUCH easier to get ready, and folding laundry is much less daunting when everything has its color-coded spot. Here’s how I did it! 1. 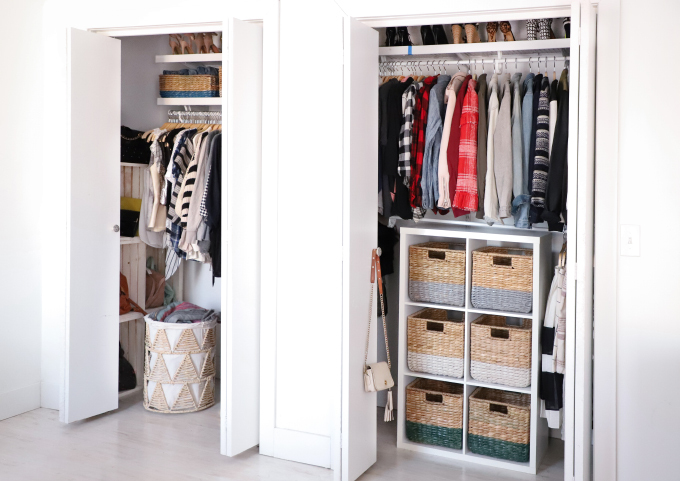 My clothes would slip off the mismatched plastic hangers all the time creating a large pile of clothing on the floor of my closet. 4. My workout clothes would always get lost because they were mixed in with my other clothes, making the task of going to gym even more difficult. Find out *The Solution! * after the break! I had my friends from The Neat Method come over and help with the clean-out process, and they left me with some amazing tips. Group all your clothing, first by type and then by color. For example, put all your T’s are together, and then group by each color. Now, the tough part for some, but the most satisfying part for me: getting rid of stuff!! Once you have all your bags filled, here is a super important step: bring to the donation center/trash immediately so you are not tempted to look back through the bags and put stuff back in your closet. I am so guilty of this, and I have never re-worn something that has made it’s way back into my closet. 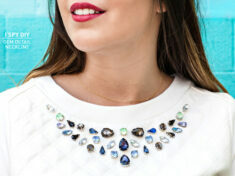 Now, time to put your newly thinned-out wardrobe back into your closet. Start by hanging as much as you can, it’s so much easier to see your clothes hanging. I originally had all my non-workout tanks, pants and sweatshirt folded, but once they were on hangers, everything was so much easier to access. 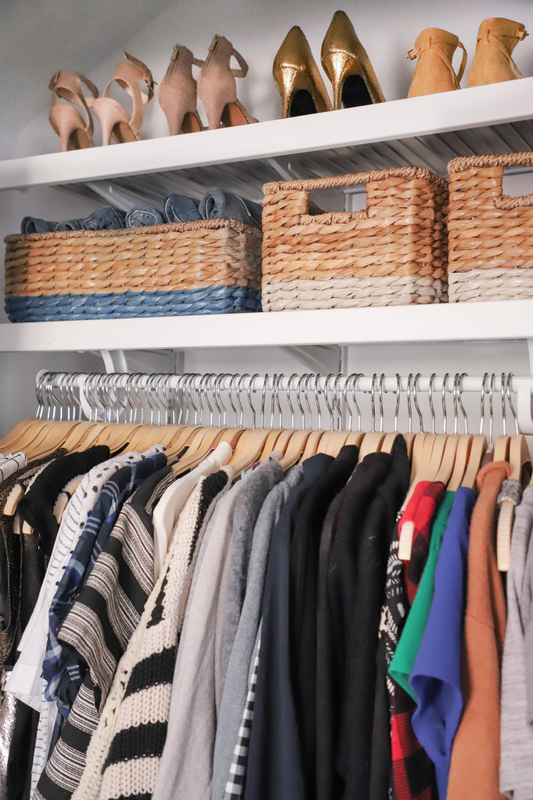 The great hanger debate: The ladies from The Neat Method brought over the slimline flocked hangers, which are amazing for saving space, but I didn’t love how they looked. I posted on Instagram that I was switching to the wood hangers, and A LOT of people warned me against it because clothes can slip off and you can’t fit as much. I am here to say I am happy I made the switch! But the key is buy these wood hangers, because they are slim and have grips that keep your clothes from slipping off. And I used these to clip and hang my skirts. Only downfall: Griff, my puppy, thought they were sticks and a couple got chomped down to wood chips in my bed…That will teach me to always hang my clothes back up! The other amazing trick I found is the Wood Front Shelf Trim, it’s a must! The trim covers the wire shelves making them look super streamlined and polished. If you look at the before and after, you can see it’s a game changer. Speaking of wire shelves, buy this liner so you can display your shoes without the heels falling through the cracks! For all my folded clothes and undergarments, I wanted to use baskets. The bigger ones are perfect for all my T’s and workout pants, and even if I don’t kept them perfectly folded, they will be nicely contained in one place. 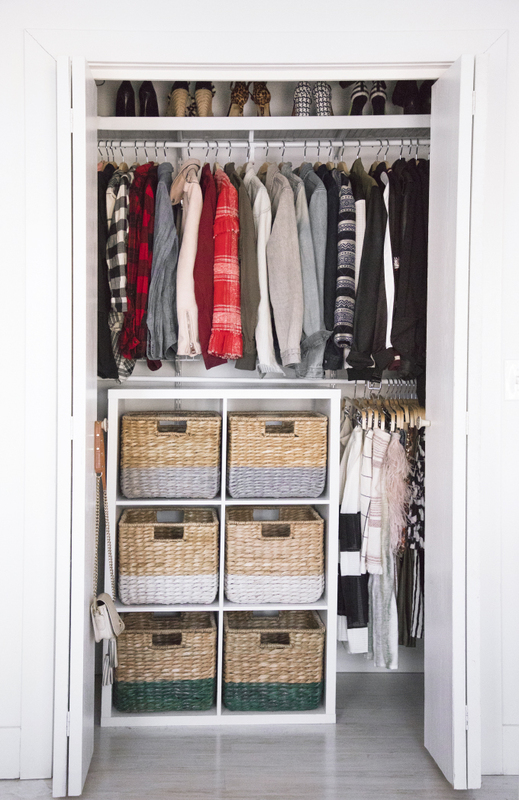 But since the baskets aren’t transparent, and most everything I own is black, color coding makes it much easier to know were everything goes, plus I like to pull out all the baskets and put on my bed when I am folding laundry and the colors make it much easier to know which clothes go where. Tape off the bottom section of the baskets. 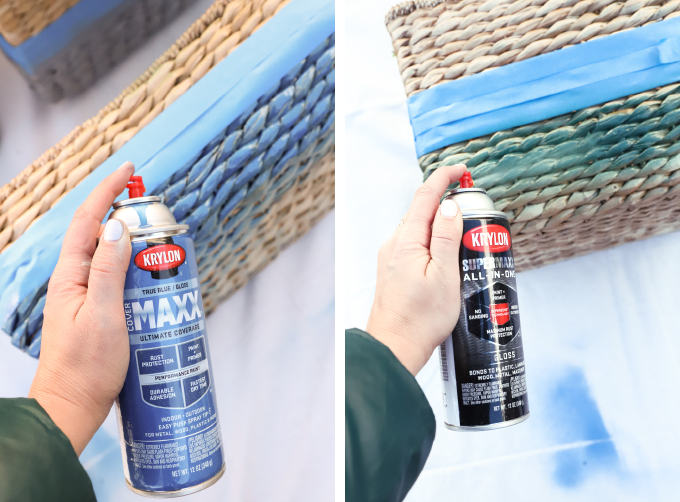 Spray one coat on the bottom third of the wicker baskets following the safety and application directions on the can. Allow to dry per the recoat instructions. 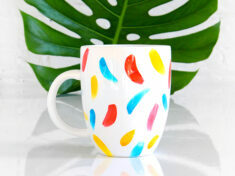 Remove tape when second coat of paint is dry to the touch. Allow the paint to fully dry before using the baskets. There you have it! Hope these tips helped and please check in with me to make sure I keep this up. Let me know if you have any questions in the comments, I am happy to help on your organizational journey! This post is sponsored by Krylon® Brand. Thank you for supporting I SPY DIY’s amazing sponsors! It looks so good now! It looks so much better than before, and those boxes are a great idea! I have organized my clothes by color as well, it’s so helpful! 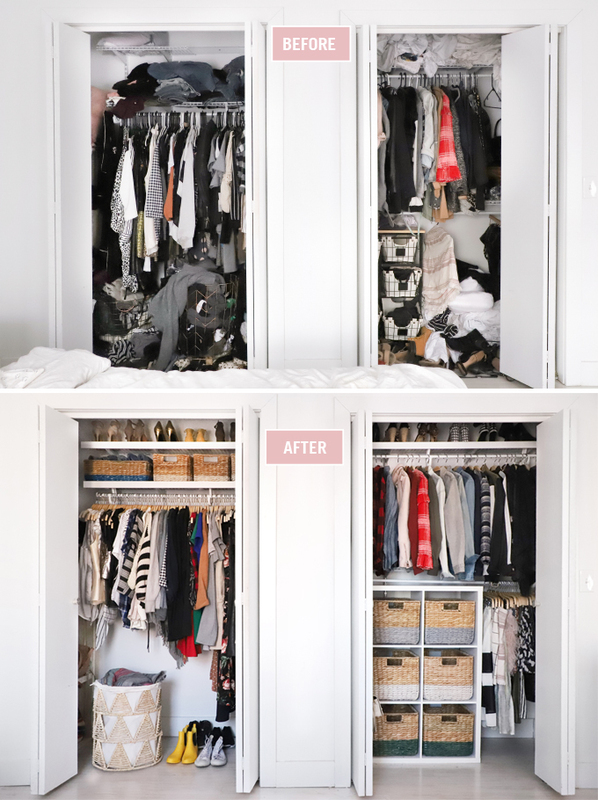 The closet looks so much better after. The storage bins are so cute. Thanks for showing the before pictures! 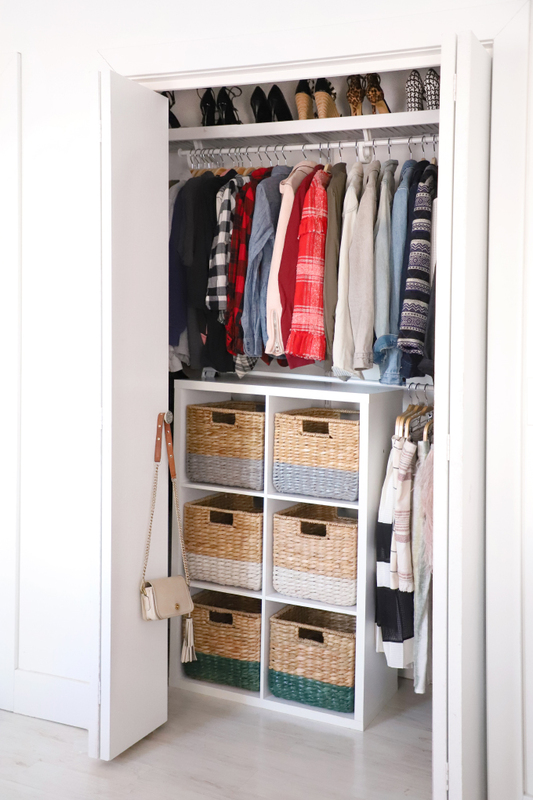 Whenever I see these posts, I’m always skeptical that MY closet can be organized, but know I think it could! I love organizational tips, thanks! I’m too short to easily reach the shelves in my closet. So, I place the off season clothes on the shelves, folded neatly sorted by type. I have a shoe rack on the floor instead of baskets. I love the tip about covering the wire shelf with a liner and using a wood front to make it look more professional! 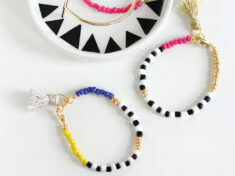 I love these pastel colors! Thanks for sharing these inspirational tips! I love your Idea it looks so good better than before. Thanks for sharing your creativity with us. The after photo looks so polished and organized yet so relaxed and not too rigid. 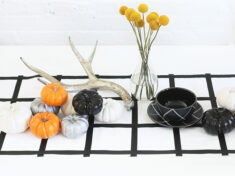 Love love the wicker basket idea! I have the same problem with the shirts and gym clothes, will have to try this method myself!